"Above All Men" Book Event with Author Eric Shonkwiler, March 6th at Florey's! Florey's Books welcomes midwest-based author Eric Shonkwiler as he reads from his new novel "Above All Men". Years from now, America is slowly collapsing. Crops are drying up and oil is running out. People flee cities for the countryside, worsening the drought and opening the land to crime. Amid this decay and strife, war veteran David Parrish fights to keep his family and farm together. However, the murder of a local child opens old wounds, forcing him to confront his own nature on a hunt through dust storms and crumbling towns for the killer. Eric Shonkwiler has had writing appear in The Los Angeles Review of Books, The Millions, Fiddleblack, [PANK] Magazine, and Midwestern Gothic. He was born and raised in Ohio, received his MFA from The University of California Riverside, and has lived and worked in every contiguous U.S. time zone. 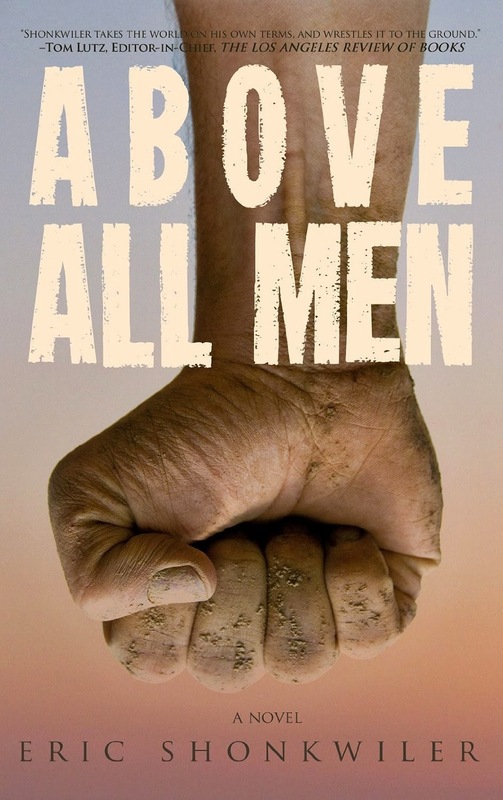 'Above All Men' is his first novel. "Getting Past Capitalism" Book Event with Author Cynthia Kaufman, March 1st at Florey's! 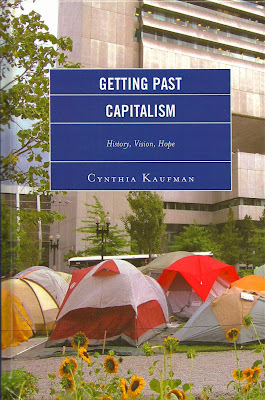 Florey's Books welcomes local author Cynthia Kaufman as she discusses her book "Getting Past Capitalism". Getting Past Capitalism begins with a critique of the impacts of capitalism on human society and the environment. It looks in new ways at what capitalism is and at how it is reproduced. That investigation opens the door to fresh ways of looking at how to challenge it. Cynthia Kaufman looks at some fundamental questions about how capitalism comes to look like a system that is unbeatable, and how people come to have desires that work to reinforce capitalism. Kaufman uses this analysis to develop ideas about how to challenge capitalism. She argues that rather than looking for the fulcrum point in a system that will make it able to be overthrown, we should try to understand what kinds of practices open more spaces for stopping the reproduction of capitalist processes, and what kinds of structures need to be developed to make capitalism a less important part of our world. Getting Past Capitalism includes a critique of capitalism and presentation of alternatives to capitalism, many of which already exist. It explores strategies for developing and strengthening those alternatives. Cynthia Kaufman is the director of the Institute of Community and Civic Engagement at De Anza College, where she also teaches philosophy. 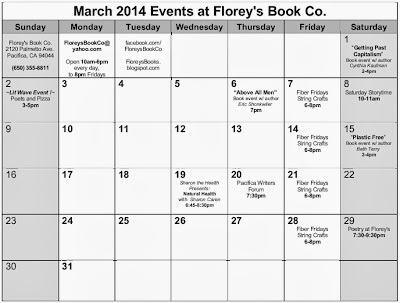 March 2014 Events at Florey's Book Co.
-"Getting Past Capitalism: History, Vision, Hope"
A critical inquiry, and suggestions for change. -Poets and Pizza ~ a Lit Wave Event! pizza, with Pacifica Poet Laureate Dorsetta Hale! A novel of rural post-collapse. A practical guide to kicking your plastic addiction. Mar. 20th, 7:30 pm. Come and share the joy of writing, reading, and poetry! 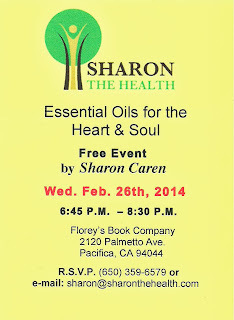 Sharon the Health Presents: 'Essential Oils for the Heart and Soul' Wed., Feb. 26th at Florey's! Heart disease is the leading killer of both men and women in the U.S. says the American Heart Association. They estimate about 71 million Americans have some form of heart disease. Two conditions, hypertension and coronary artery disease, contribute to more than 7 million heart attacks every year and high blood pressure is a leading contributor to the 5 million strokes occurring annually. Through a healthy Heart, we find our deep Soul connection and peace of mind. 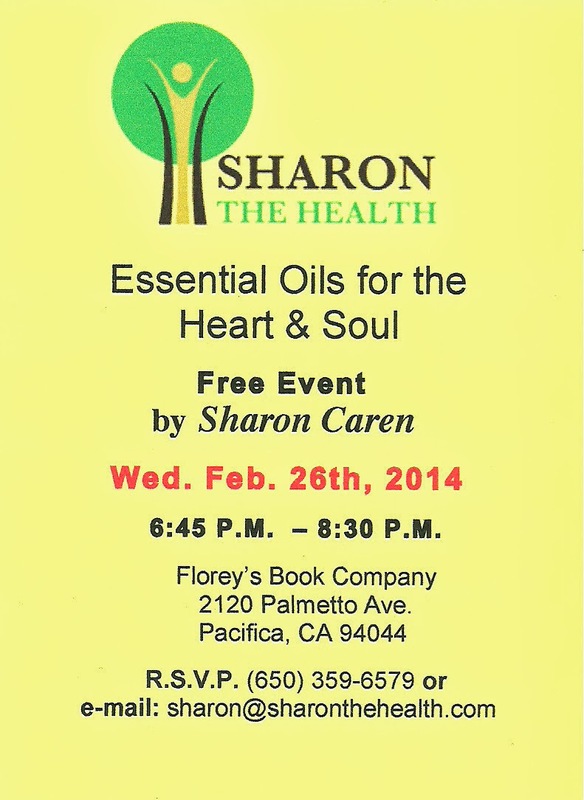 Come learn some basics to promote a healthy heart naturally. You can experience these methods in person! Some of our Young Living Essential Oil Blends helpful to promote Heart Health are Peace and Calming, Joy, Valor and Stress Away. These 4 amazing blends are available in the Everyday Oils Kit which every household needs for an at home First Aid Kit replacing OTC drugs! 2014 LitWave - The Pacifica Literary Festival! Feb. 24th - Mar. 2nd! Welcome to Lit Wave 2014! Pacifica Lit Wave is an exciting week-long celebration of the Coast’s rich literary culture. You will find something for everyone – events for the young and young at heart, in venues indoors and out. Join us and discover the amazing literary world on your shores! To offer the Coast Side a range of literature based experiences at diverse venues so that all readers can celebrate the written & spoken word and discover the joys of literature. Children who have participated in the Write On! Poetry Contest are invited to enjoy pizza and read their original poems at Florey’s with the new Pacifica Poet Laureate – Dorsetta Hale! 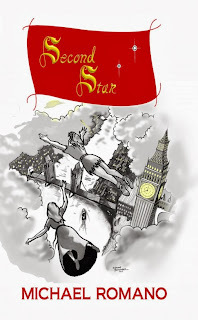 "Second Star" Book Event with Author Michael Romano, Feb. 23rd, 1-3pm! 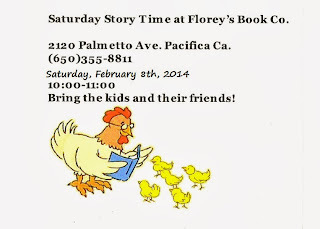 Florey's Books welcomes Pacifica author Michael Romano as he discusses his new children's book "Second Star". 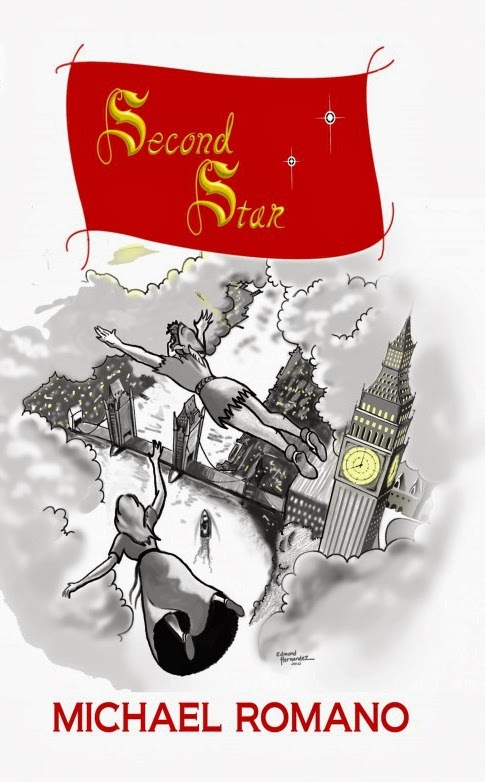 In the magical world of Neverland, Peter awakened one morning a lot older, with only himself and Tink. 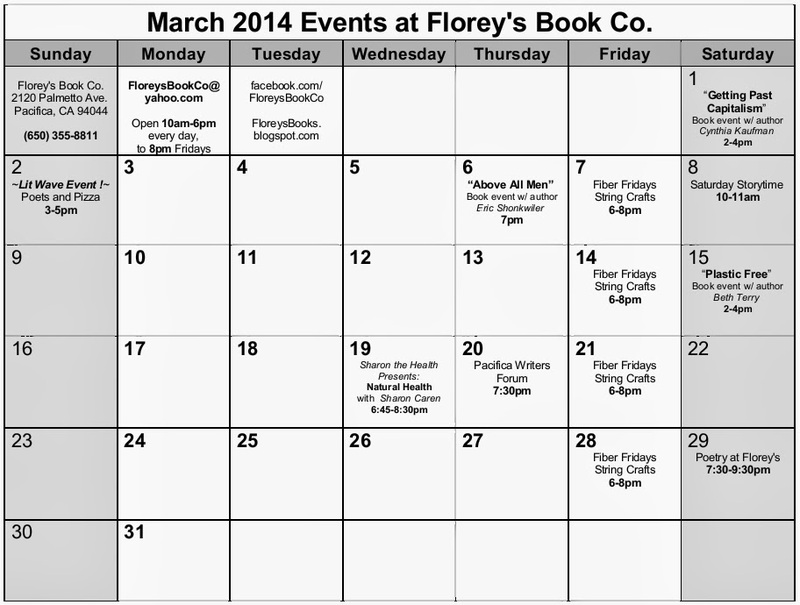 February 2014 Poetry at Florey's! The featured poets this month are: Clara Hsu and Wendy Brady. The featured poets will be followed by an open mic period. Open mic sign-up is first come, first served. This event is open to the public and free of charge. 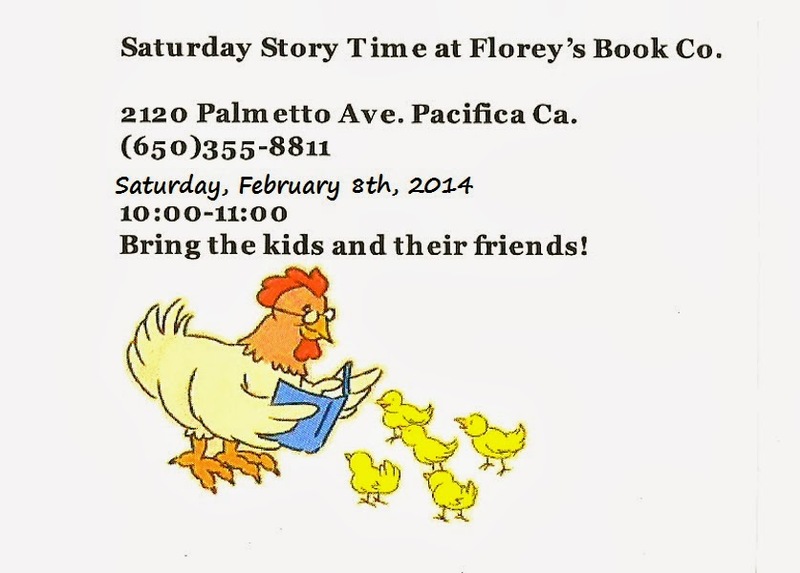 Pacifica Writers Forum, February 20th at Florey's! "Potions and Paper Cranes" Book Event with publisher Lian Gouw, Feb. 8th, 2-4pm! 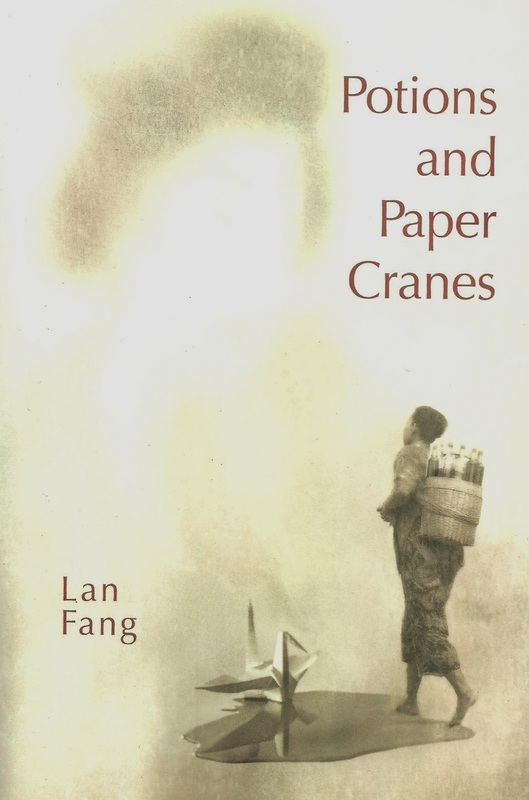 Florey's Books welcomes local publisher Lian Gouw as she presents the new historical novel "Potions and Paper Cranes" by acclaimed Indonesian novelist Lan Fang. Sulis is a young woman who sells potions in Surabaya’s harbor district. In her basket she carries sweet rice and ginger potion, betel leaf potion, and tamarind leaf refreshing potion. Her tonics remedy everything from obesity to weakening virility. The route is long and the days are hot. She meets Sujono, a coolie with dreams of becoming a freedom fighter. They marry and have a son, Joko, that Sujono believes is from Sulis being with another man. Behind the walls of their squalid tenement they fight their own war, while on the streets World War II comes to an end and the Indonesian Revolution is on the rise. Matsumi, a poor girl growing up in a fishing village in Japan, always wanted to be a geisha. Her beauty and grace help Matsumi realize her goal and soon she is called to Java by a Japanese general to provide him with pleasure while waging war. She works at a club on Kembang Jepun until Sujono sees her. He is immediately taken by her exotic loveliness. They, too, have a child, and are torn apart by desire and jealousy while Indonesia struggles for its first breaths as a new nation.